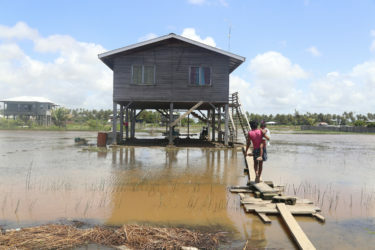 With floodwater coursing down the Mahaicony River, several Region Five villages remained inundated yesterday and as farmers and householders counted their losses, questions were being raised as to why the drainage authority wasn’t doing more to relieve their plight. 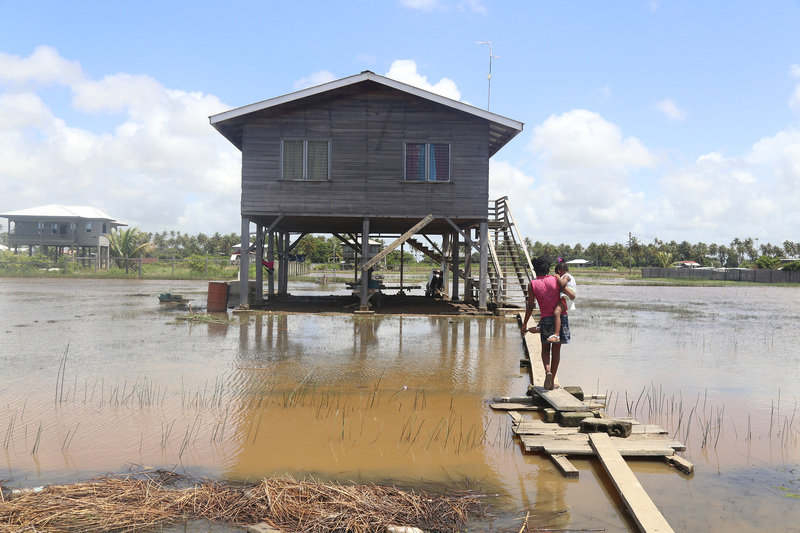 Heavy rain last week in the Mahaicony watershed flooded Moraikobai in the upper reaches and was a clear indicator that communities downstream were at risk. Stabroek News had reported yesterday that there was deep flooding in parts of Region Five and the Chairman of the Mahaica-Berbice region, Vickchand Ramphal had told Stabroek News that while various communities were under water, the National Drainage and Irrigation Authority (NDIA) in collaboration with the Mahaica, Mahai-cony, Abary-Agriculture Development Authority (MMA-ADA) had sent several excavators and pumps around the region in the hope of taking down the water level. Ramphal had pointed out that the canal and sluice at Trafalgar is heavily silted up and while a hydraulic pump was installed it would be insufficient to handle the amount of water on the land currently. 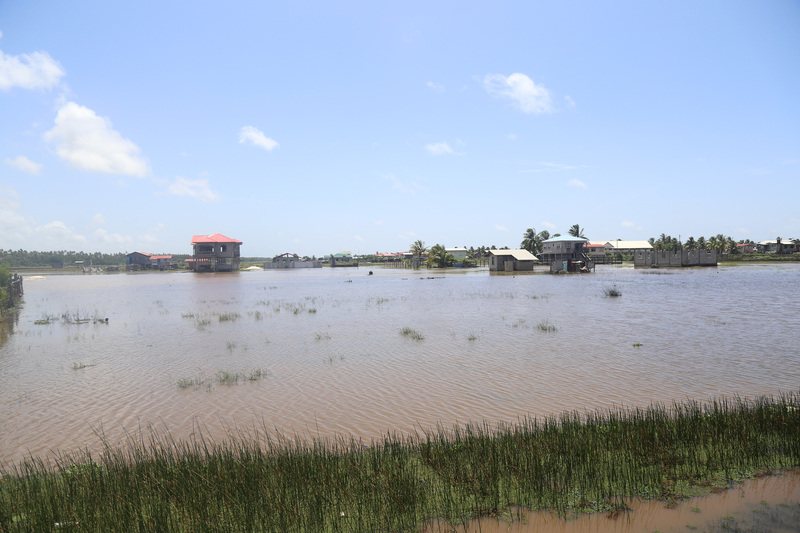 When Stabroek News visited the communities of Trafalgar, Lovely Lass, Union, Number 30 Village and Number 29 Village yesterday, yards were flooded, some with over two feet of water. Acres of land were covered with water as far as the eye could see. Lone houses were surrounded by large bodies of water and it was difficult to tell where the trench was from the land. Makeshift bridges were so deeply submerged in the murky water that they were hard to spot. One resident of Trafal-gar, Lance Faucet, who has been living in the community all his life, said that he had not seen such major flooding in the area since 2002. He highlighted the same issue as Ramphal and said that the main reason for the accumulation of water in the areas was because the channel in front of the koker was heavily silted and only one pump was installed. “You see this area is low and years ago they had installed four big pumps to deal with the water and eventually two of the pumps were removed by the previous government and the other two weren’t maintained and now they have one lil pump trying to deal with all the water and the koker door ain’t opening,” Faucet said, explaining that they had two excavators on a pontoon trying to clear the channels but they were unsuccessful. “We came out here and they had a Hymac on a pontoon saying they dredging the channel and they had it on the inside and they should’ve been doing it from the outside coming in and they get stuck and they couldn’t continue,” Dwayne Garett, from Lovely Lass, explained. The small mobile pump in the middle of the two larger pumps that used to work at the Trafalgar station. One of the playgrounds in the area underwater. 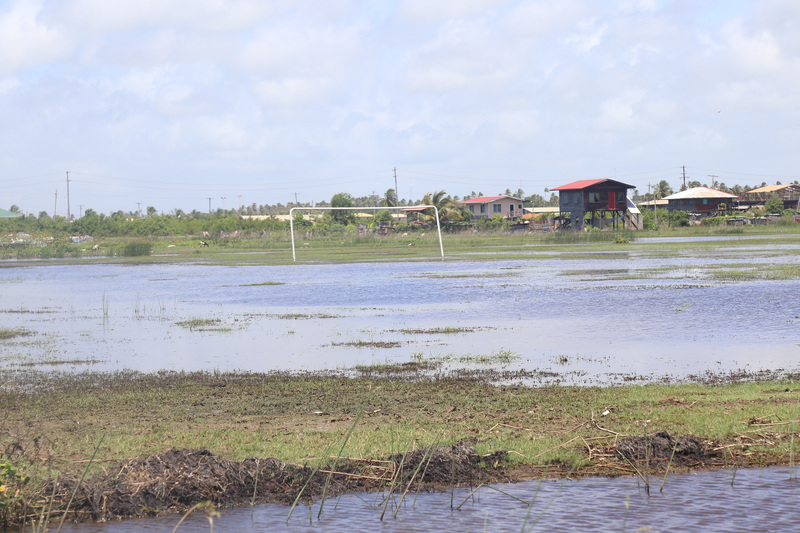 One of the flooded yards on the Trafalgar, West Coast Berbice roadway. A pump valiantly trying to clear water from one of Trafalgar’s canal as an excavator attempts to clear vegetation from the canal. Jenny Richards walking through the water around her home. A large area of land covered in water with houses in the background. Residents have to trek through the water to get to their homes. Garett, who is a carpenter but has a kitchen garden, stated that his yard has been covered with water for over a month. “The water coming down [from the Mahaicony River] and it mixing with the rain and that’s the problem there cause it building up and it ain’t got nowhere to go. It was about a foot and I till on the roadside living and certain areas got more, more water,” Garett explained, stating that while the water has receded “a little” there is still a significant amount on his land and it has damaged his crops. “Lots of plants in me garden die out cause it flood up. Is about 50 pepper plants and some bora and tomatoes all dead and you can’t even seh you gon plant back because the water just deh and stubborn,” Garett said. “One man lost 3,000 bora and goats, chicken, sheep and all kind of crops and the water just won’t go down so we gotto bear with it,” he added. The mostly stagnant water has started to give off a foul scent that is becoming overbearing to residents. 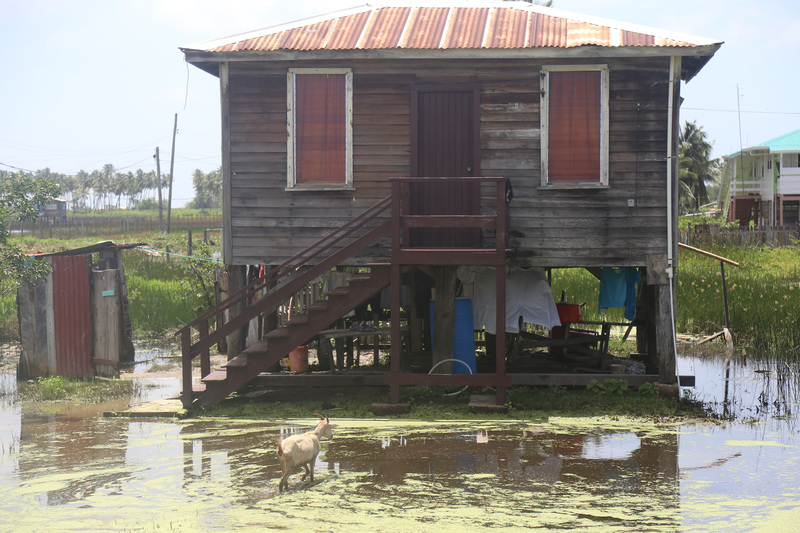 Another resident from Number 29 village told Stabroek News that the water has been on his land and in the community for about 6 weeks since the rainy season started. “I can’t come downstairs and do nothing because the yard so flood and I had to even put a long bridge from the yard to the road how the water so high and is not only that, the water does smell real bad and you can see how it murky,” the man lamented. He added that while he was rearing 25 chickens, three of them died and he was forced to move the entire pen to one of his relatives. 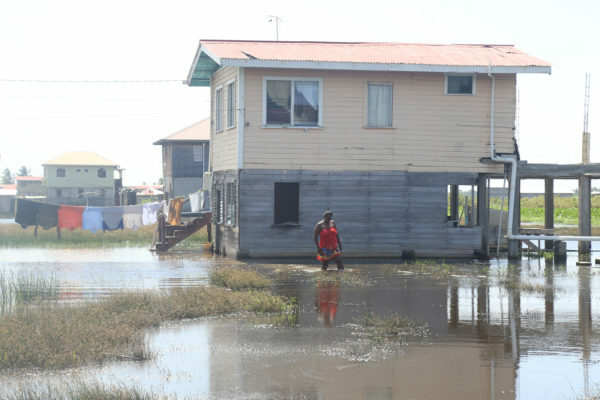 Jenny Richards, a policewoman, who has been living in Trafalgar for almost 15 years, stood in about two feet of water yesterday and explained to Stabroek News that since she works the night shift most of the times, she is forced leave the house without wearing her boots and socks. “The water does be too high and it does even get in the long boots so I ain’t got a choice you know. I gotto stay here, where I gon go?” Richards questioned, stating that most nights she would have a difficult time getting across the makeshift bridge because of the darkness coupled with the high water. Richards said that furniture that was in her lower flat was damaged along with several other appliances but she has ceased “fretting over it …Cause it happening since last month and now it here again and what you gonna do? You can’t go anywhere and is only when I gotto work I does leave,” the distraught woman explained. Another resident, Henry Jacobs, expressed his frustration with the flooding and stated that he did not think the authorities were doing enough to tackle and assist with the situation. “It’s the same thing like they [MMA-ADA and NDIA] inherit from the past government ‘cause nobody ain’t coming in and see what going on. They just sitting in dey office and pretending they know what going on but they gotto come out and see what the people going through,” Jacobs declared, stating that what they are currently doing is not enough and that there is a need for the trenches and canals to be desilted. Faucet also shared the same sentiments as Jacobs and explained that while they have several excavators currently digging around the areas and pumps moving water, the problem can only be fixed if they added more pumps to the Trafalgar Pump Station. “They got things digging and pumps in places but it’s a waste of time and money cause if you can’t get the water out of the place and over the seawall then it’s still going to stay flood,” he said, pointing out that the situation would’ve been worse if the sluices at Abary and D’Edward weren’t working. 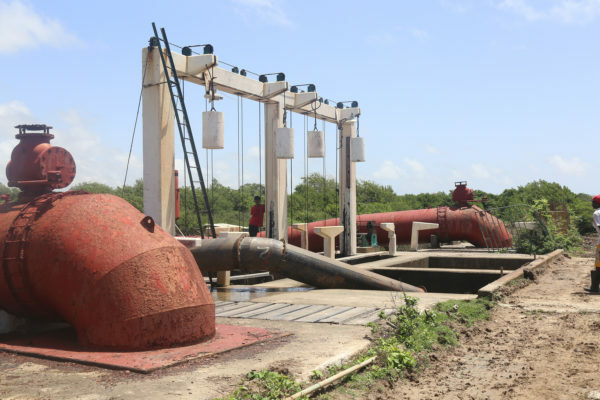 When Stabroek News visited the Trafalgar Pump Station, a lone, small mobile pump was set in the middle of two large pumps that were left like monuments. The old station management room stood tightly shut. In addition to placing the two pumps, Faucet and the other residents explained that the authorities were too slow in addressing the issues and should’ve cleaned the trenches, canals and channels in the dry season. “Now see, this is the problem with all these man. They does wait until the problem does happen to try to fix it. Is like they don’t think ahead and people talking about these place need cleaning and this channel need fixing long and they wait until it rainy and we flooding to do some,” Facet said. Faucet opined that a quick solution to the problem would be if the original pumps were placed back at the Trafalgar Pump station as the one that was sited there currently cannot even work half as good as the original one. “Think about the amount of water them four pumps would clear off if they didn’t move it. Now they got that little thing trying but it ain’t gonna do anything much,” he said. 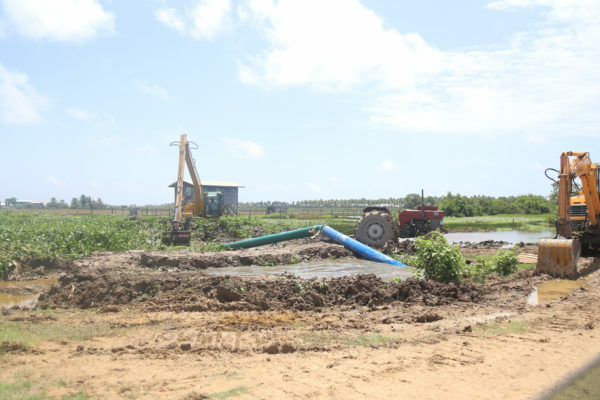 Ramphal told Stabroek News yesterday that currently the areas in West Coast Berbice and along the Mahaicony River are heavily affected by the buildup of water and while the MMA-ADA has installed the mobile pump at the Trafalgar Pump station it doesn’t have the capacity to drain the entire area and as such a decision was made to place another one but he is unsure when that will happen. He emphasized that the region does not have the resources to deal with the issue. It is relying heavily on the assistance of the MMA-ADA and NDIA and is in constant contact with them. “We are receiving some assistance and there are losses with the cash crop farmers, livestock and even some rice lands in the Mahaicony River area has been damaged but as of now we cannot say for sure how bad it is,” Ramphal said, noting that the Ministry of Agriculture is aware and is engaging on the issue. There has been no statement from the government on flooding on the West Berbice. While the region is receiving assistance, Ramphal said he believes that there is more than can be done from central government for the region. “There is a need across the region presently for excavators, pumps and so on and we know that at this moment those agencies might not even have the resource either,” he said. While residents have complained that the authorities have not visited, Ramphal said that he had inspected all of the areas. “I have visited the areas even Moraikobai and all the others in West Berbice and it’s obvious that you cannot meet with all of the residents of the areas so some might not be aware,” he said.